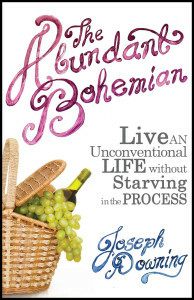 The Abundant Bohemian by Joseph Downing is a guide to living an unconventional life, while managing to be happy and make a living in the process. Joe wanted to produce a quality book, and he knew the traditional publishing route wasn’t the only way to accomplish that goal. Columbus Publishing Lab isn’t the biggest, or flashiest self-publisher on the block, but we know how to produce great books. …in our all-or-nothing, win-at-all-costs culture, we desperately want the stamp of validation on our work. We’re not writers until a New York publishing house publishes our novel. We’re not painters until we have a show at a prestigious gallery. We’re not musicians without a record contract. It’s time to let all that go. The first step to producing a professional book is developmental editing. In a developmental edit, an experienced editor examines elements of the book like narrative arc and plot structure, and provides a detailed report with recommendations to improve areas of concern. The Abundant Bohemian was subjected to a rigorous developmental edit before the rest of the publishing process took place. As a result, Joe was able to act on the suggestions of our editor to improve his book before it was released. From there, a copy editor read through The Abundant Bohemian line by line, correcting any grammar and spelling mistakes, and standardizing elements of the book to a style guide. The interior of the book was then professionally formatted for both print and e-book markets, and a final proofread was completed before the book went to the printer. Our team of designers and illustrators created a custom cover design to fit the aesthetic of Joe’s book, and to provide a professional front for his work. The Abundant Bohemian is available through all major online print and e-book retailers through our distribution services. We handle the printing, shipping and fulfillment, providing a hassle-free experience for Joe. Because of the exceptional quality of the book, it is distributed under our premier imprint- Boyle & Dalton. We guarantee The Abundant Bohemian is of the same quality as a book produced by the finest independent and traditional publishers. Find The Abundant Bohemian here. Throughout the publishing process, Joe always had a dedicated point of contact. When he had a question, or wanted an update, there was always someone ready to take his call. We’re committed to making the publishing process simple, professional and enjoyable for our authors. If you’re thinking about self-publishing, contact us here. We’d love to help you produce an exceptional book.